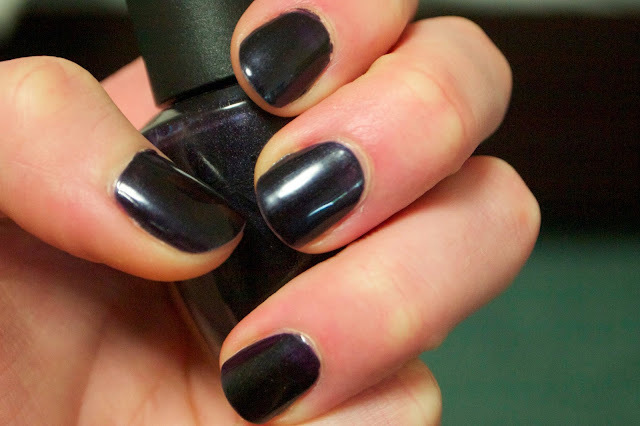 OPI's 'Light My Sapphire' is a deep bluish/purple with silver micro-glitter that gives it an almost cloudy sheen. Since it is a very dark colour, I was worried that the formula would be difficult to work with and bleed easily, but this formula has to be one of the best OPI formulas that I have ever worked with. It has a smooth, buttery consistency and is opaque after applying two coats. Super, just super! Despite the great formula, I have to admit that I found myself getting bored of this colour quite quickly. Maybe I'm just too excited for spring but I found the colour to be too deep and dark; not having enough dimension. Since it is named after a gem, I was hoping for a more vibrant shade of blue but it ended up being almost dull-looking in certain lighting. What's your favourite OPI nail polish?? This is a nice coulor - but maybe save it for winter. I love OPI polishes and I like the colour too, I can see what you mean about getting a little bored of it, but in nov/dec time I can tell it' a lovely shade to wear! Gorgeous nail colour! I love almost black nail colours!! I love a dark nail polish and the glitter accents in this are spot on! i actually dont have a favourite nail polish.. any red nail polish will do for me lol. but i love this colour! As I'm going into the cooler months here in Aus (finally!) I really love this shade! I'm wearing something fairly similar right now, except it's more purple toned than blue toned.